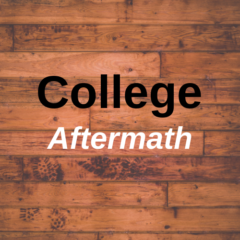 In some ways, graduating from college can feel like starting your life over again. New places, new people, new things to worry about… so how do you keep everything on track? We all have grandiose ideals of what we want our futures to look like, but graduation is a great time to set some realistic short-term and long-term goals for ourselves. Start this new journey off on the right foot by following these tips for success. Whether you’ve found a post-grad job or you’re still on the hunt, now is the time to get the hang of networking. Even if you landed a job in your field of interest, it’s unlikely that it fulfills everything on your wishlist. Networking can put you on the path toward that dream job. Check out events through your alumni network, Meetup.com or local chambers of commerce. In the short term, your goal may be to find a job you enjoy or learn more about your career path. Speak with professionals to learn more about their careers, and be open with them about looking for a job in the field. Networking is great for long-term success, too. If you make meaningful connections, they can last your whole career. Ten years down the road, a great opportunity could open up with someone you met at a networking event yesterday. You may think that you’re too young to start investing and saving your money, but in reality, this is the best time to start. Up until this point, you’ve been in a structured education system where you were unlikely able to work full time, and if you did, that money probably went toward school. Now that you have a bit more freedom with your income, consider investing in retirement funds, personal savings accounts, etc. Once you make those investments, you also need to protect them. A common goal for recent graduates is to buy a home. If you are able to do so, make sure your savings don’t stop there. Do some research into home warranty protection plans to save yourself from unexpected expenses. The same applies for any big purchase; you do not want to get stuck with surprising charges for any investment. Good things take time. You may see friends on social media moving at a different pace than you; try not to compare yourself to others, only reflect on how you are progressing toward your goals. It may take a year of part-time jobs to finally land a job that will start your career, but that doesn’t mean you’re failing or are behind. Set smaller goals, like going to two new networking events each month or shadowing someone interesting each week. It is likely that not everything will fall into place right away, so be proud of yourself for what you do accomplish and keep pushing forward to those bigger goals.